Abercrombie & Fitch have a new campaign out. I just received this file on an email and I just thought that his packages looks pretty darn good! I just received this press release from DreamWorks. It looks interesting! 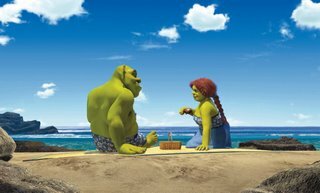 DreamWorks Animation announced today that the final cast for its upcoming computer-animated comedy “Shrek the Third” has been set. The original casts from “Shrek” and “Shrek 2” – Mike Myers, Eddie Murphy, Cameron Diaz, Antonio Banderas, Rupert Everett, Julie Andrews and John Cleese -- will reprise their roles in this third chapter of the Shrek story. Joining the cast for “Shrek the Third” is an all-new ensemble of actors and comedians. Grammy Award-winning singer/songwriter Justin Timberlake will play the role of Fiona’s rebellious teenage cousin Artie, the inimitable Eric Idle (the “Monty Python” movies and series, “Spamalot” on Broadway) will play Merlin and John Krasinski (TV’s “The Office”) will play Lancelot. Making up a new fighting force of fairy tale princesses are: Cheri Oteri (TV’s “Saturday Night Live”) as Sleeping Beauty, Amy Poehler (the upcoming “Blades of Glory,” “Mean Girls”) as Snow White, Maya Rudolph (“A Prairie Home Companion,” TV’s “Saturday Night Live”) as Rapunzel, and Amy Sedaris (“Strangers with Candy”) as Cinderella. Ian McShane (TV’s “Deadwood”) will play Captain Hook. Slated for release on May 18, 2007, “Shrek the Third” is being directed by Chris Miller and co-directed by Raman Hui. The film is being produced by Aron Warner and executive produced by Andrew Adamson and John H. Williams. When Shrek married Princess Fiona, becoming the next King and Queen of Far, Far Away wasn’t part of the plan. So when his father-in-law, King Harold, falls ill, it is up to Shrek to find a suitable heir or he will be forced to give up his beloved swamp for the throne. Recruiting Donkey and Puss In Boots for a new quest, Shrek sets out to bring back the rightful heir to the throne, Fiona’s rebellious cousin Artie. Back in Far, Far Away, Fiona’s jilted Prince Charming storms the city with an army of fairy tale villains to seize the throne. But they have a surprise in store because Fiona, together with her mother, Queen Lillian, has drafted her fellow fairy tale heroines to defend their “happily ever afters.” As Shrek, Donkey and Puss work on changing Artie from a royal pain in the you-know-what into a future king, Fiona and her band of princesses must stop Prince Charming to ensure there will be a kingdom left to rule. 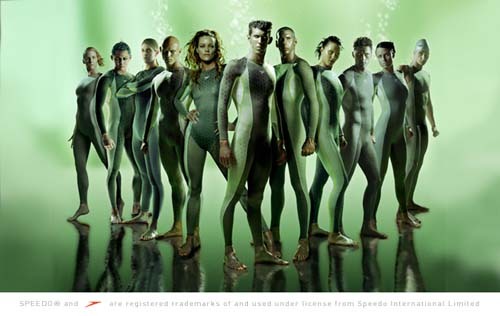 Unfortunately I couldn't find a higher resolution picture, but I have to say that the outfits are pretty hot. I know that Michael Phelps is not the most handsome man but God he has a great body! I know this image is not new, but again I just have to had it in my blog. I actually didn't pay attention on how interesting Tobey's package looks. I think he always looks good on that outfit. 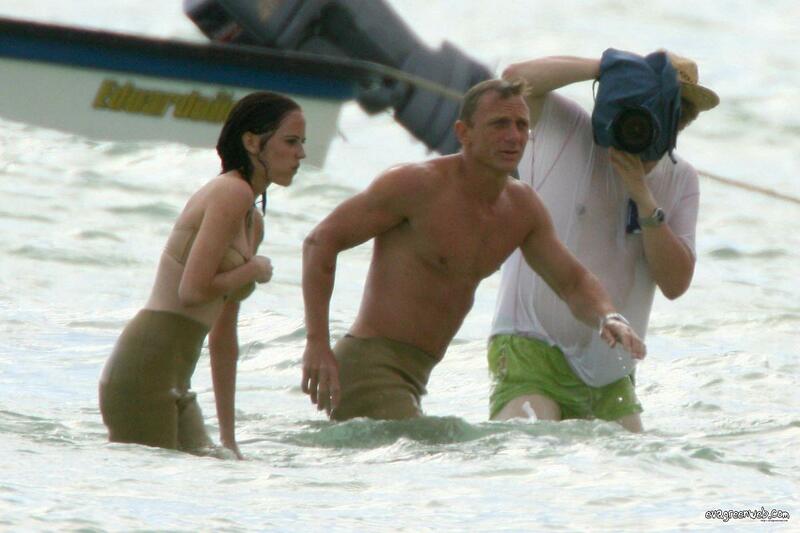 Although I have mixed emotions Daniel Craig being the new James Bond I have to say that I just love this couple of pictures of him. I know they have been around for a while but I just have to have them on my blog. 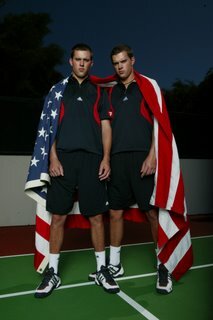 For those of you that have not seen them yet... well enjoy! 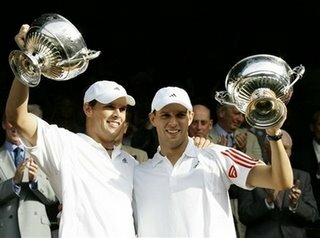 Twin brothers Bob and Mike Bryan won the Men's Doubles final at Wimbledon last Saturday. They are team members of the Kansas City Explorers and will be playing at their new house at Barney Allis Plaza in downtown Kansas City during this month. Besides being pretty talented players they are really hot, as you can see on the picture courtesy of Adidas. I received a comment about not including Iker Casillas on the most handsome players list... wel how about just have him by himself! He is actually pretty cute! With all the Soccer World Cup crazinness coming to an end, I wanted to give Freddie Ljungberg the chance to be part of my Monday's Crush. Ever since I saw the first ad that he did for Calvin Klein I have to admit that he is part of my VIP collection of men. Freddie was born April 16, 1997, in Vittsjo, Sweden. He has one brother (Filip). I took the video from YouTube and it was added by janbobs. All of them should celebrate like this! Thanks Gennaro Gattuso (left) for showing your underwear! I think that the whole team should have done the same. 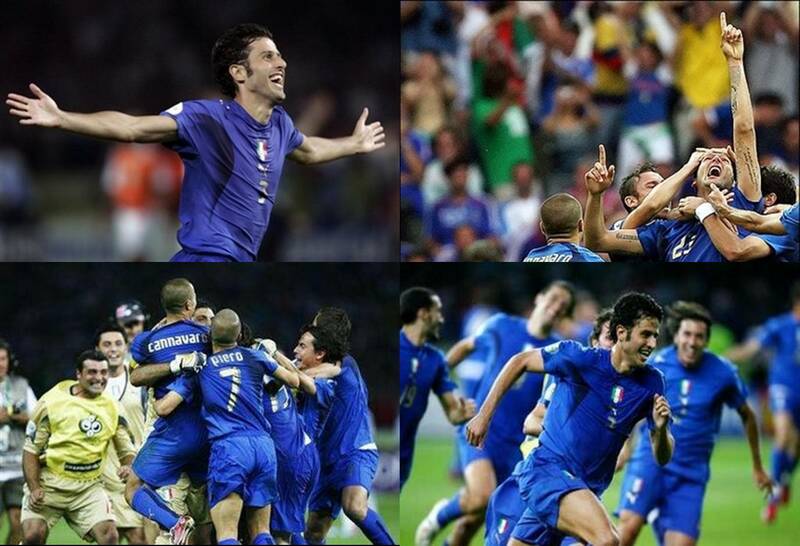 Not an easy game and Italy wins the World Cup in shootout. 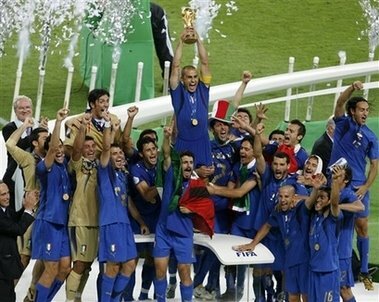 Congratulations Italy! 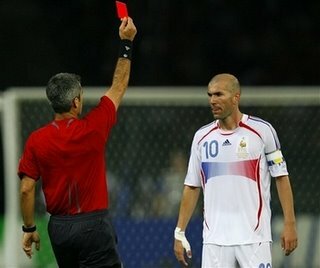 It was very sad to see French captain Zinedine Zidane say good bye to the World Cup as he was shown a red card for head-butting Italy's Marco Materazzi in the chest in the sixth minute of the second overtime on today's final match. I do understand that he was pretty upset about what was going on in the game and probably to something that Materazzi did or said to him, but his reaction was childish and stupid.